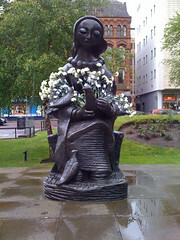 The Mes­sen­ger of Peace stat­ue (Bar­bara Pear­son, 1986) sits in St Peter’s Square in Man­ches­ter, out­side the town hall. Some­one has added car­na­tions, each with a person’s name writ­ten on a tag on the stem. Author alanPosted on 11th May 2009 Categories MiscellaneousLeave a comment on What sort of day is it in the UK?